Luckily this page has everything you need to know to avoid that fate, plus to get rid of it as fast and as smoothly as possible! They are ‘blind pimples’ because they have no head. More painful and larger than your average pimple because the inflammation is so deep within the skin, closer to the nerves. And not only are they painful – they are tough to get rid of! 1) The early stage – developing as a red, sore lump deep in the skin – the best time to treat it! After you’ve learnt how to treat a blind pimple, see how to prevent them here. Because prevention is definitely better than trying to cure one! It will usually make its way to the surface of the skin and eventually and form a head, where it then behaves like a normal whitehead. The best treatment for a blind pimple will depend on the stage you’ve found it at. First, a deep red spot develops, usually painful and you just know something is brewing beneath your skin. To further reduce inflammation you can apply a clay mask directly to the spot. This can drastically reduce redness, pain and life span. If you can leave it on overnight, even better! Plus, if the pimple is further along than the beginning stages, icing may not be able to stop it. A good clay mask will draw it to the surface of the skin while reducing inflammation. This means a smaller pimple on the surface which is much easier to deal with – win win! A clay mask helps with shine, breakouts, blackheads and pimples! Applied overnight, it is a great, easy spot treatment for any type of pimple. Who doesn’t like waking up to clearer, easier to manage skin?! A good, simple and affordable product is Freeman’s Feeling Beautiful Clay Mask. This features kaolin and bentonite clay as the top ingredients – well worth using regularly! It is still deep, red and painful, but it’s further along and starting to develop a whitehead. Once it’s drawn to a head, use your better judgement for the best treatment. Often they are still too tender and inflamed to be squeezed at this stage. (Always err on the side of caution, usually a blind pimple should never be squeezed at all as it’s more likely to scar due to the inflammation). If this is the case – apply ice and/or the clay mask as above. What’s The Best Way To Get Rid Of Your Blind Pimple? Squeeze it – very carefully and only if the inflammation has completely reduced. You can usually tell as it looks like it’s about to pop on its own! I also have a blind pimples that are so star born… it about 3 & the half year I have this pimples I try to many things they doesn’t work… and now I’m lost of what can I do… I even got a stress because of this blind pimples I have… I became shy in front of people… please help me guys what can I do??? My jaw line has been breaking out like crazy! They are all Blind ! Stupid me kept picking so it looks like I have chicken pox!! How can I fix it? Hi Malissa – sorry for the delay, hopefully this can still help or help someone else reading! If you’ve already popped a blind pimple and made a mess (don’t worry, this is so common! ), apply ice straight away. 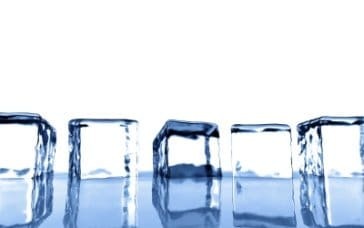 Wrap an ice cube in a paper towel and hold it against the pimple for 5mins on and off for as long as you can. This will help keep the swelling and redness down. Then you can apply some rubbing alcohol to dry it out, or first aid bacteria ointment. Then leave it alone 🙂 To prevent scarring you might like to apply vaseline or the first aid ointment regularly as it’s healing to keep it from drying out too much. I have struggled with hormonal, dietary, and cosmetic related acne for years. Cutting out or reducing dairy intake can really make a difference. Generally taking care of your health, drinking lots of water, getting rest every night on a consistent schedule, these things help. If your skin is more acne prone, oily or combination type I wouldn’t recommend liquid foundations as I’ve noticed a drastic difference in my skin by sticking to powder foundations like bare minerals. I have found that gentle natural cleansers work the best for me. I couple that with liberally applying quality coconut oil to my skin, and it hasn’t looked as good as it has for a long time. The oil will ensure that you don’t overproduce your own oils which can cause complications. it is also antimicrobial and will prevent infections from forming and spreading. If i have a tough blemish, usually cystic or blind on the sides of my chin (hormonal) Tea tree oil, charcoal masks, and apple cider vinegar (diluted) have worked for me with spot treatment. Using coconut oil more liberally has also helped. Keeping your skin clear is never one size fits all. Managing your overall health has a big effect on it, and keeping your skin clean and hydrated makes a difference. What about using a drawing like ichthamyl on a blind pimple.? Ive been dealing with this type of acne all over my face for the past years idk what’s wrong I get it so often and not just one like several pimples especially on my forehead and my cheeks. This literally gives me depression and I was going to go to the dermatologist but my mom use to go to one for mild acne and she said they will give out these curing things that work for awhile at first but make it worse later on and kills our natural skin’s routine so I haven’t been going. I’ve noticed that everytime when I eat smth spicy or very oily I get these so I cut them off for or awhile but I still get them:( idk how to cure these someone plz help an reply becuz I’m so tired of constantly having these blind pimples everyday single day of my life when one goes away after like 2 weeks another comes up right next to it…. Hi Gloria – I’m sorry to hear about your skin troubles, I know how absolutely frustrating it can be. It’s good you noticed certain things that may make them worse (like spicy food), I would suggest writing everything down in a “skin journal” from now on. Just really simple notes about what you ate, used on your skin, stress etc, with the date (a basic calendar page printed out works), and after a month or two you WILL notice a pattern. If you deal with them frequently it may be hormonal – and writing it down will give you some idea of a pattern. I hope that helps – don’t give up! In the meantime, follow the advice in the article above when you notice them coming, especially the ice – it really can help! Hi! Not sure is you still neeadvice but I demal wity the same thing. I do have a perscribed face wash from myfamily doctor but she also told me to change my shampoo to a sulfate free, paraben free brand. And once i did that my skin didnt clear up completeley but damn did it help. I’ll tell you something that totally works to draw out the underground pimples— vaporub! Yes, just put a dab of vaporub on the sore spot st bedtime for a few days, and it will either shrink down or come out so you can drain it. It’s magic! I wish I had know that years ago, but I just discovered it in the last few months. Good luck! Hey! Do you have a lot of dairy in your diet? If so, you should consider cutting it out completely. I had really bad acne all over my face 2 years ago and it helped a lot when I cut out dairy. I recently started having milk again and I have a huge blind pimple on my cheek now. Now I am so sure that the way to go is staying away from dairy. Hope this helps! Hey, I know your comment is super super old now lol, but for future assistance get something called bump eraiser. Its generally for ingrown hairs but there is one called medipaste and if you put it on a bunch of times in one day, almost always the blind pimple is gone or at least going down and not sore the next day! I taped a slice of raw (organic) ginger to it overnight. It’s WAY better this morning. Only sore in a very small area. I expect it now to clear up or come to a head. I use ginger the same way for infections, too. I’ve used it on fingers, toes, gums. It always clears it up quickly. I use a benzoyl peroxide cream when I have blind pimples. I purchased a small tube at Target for $10 USD. Right before bed, I wash my face, moisturize. (with Thayer’s rose water witch hazel toner,) and then apply the cream. It helps! Also, I wash and change the pillowcases often. I haven’t tried the ice trick, but I will now. I’m not scsremongering and saying everyone has diabetes but be aware of the effect the food you eat has on your body. I have a big pimple on my nose that is very red and sticks out very badly ive tried everything and it still wont move any help? I’ve tried the lemon juice on both blind and normal pimples. Since I look at my face every day, I would think I’d be able to notice any change. Not much has happened with it, but I can say the ice reduces swelling! You can try Vicks! it works wonders! Any idea why people get these? I had one about two weeks ago and just noticed another one right below where the other is still healing. I am a regular face washer and wear no make up. I have generally clear normal skin. This type of acne develops from a combination of sebum (oil), bacteria, and dirt that becomes trapped in your pore. The end result is a painful lump under your skin that doesn’t have a “head” like other pimples might have. It’s often dietary. If this happens to you stay away from foods with hormones in it. Milk, for example. Red meats. I know that everytime I drink Milk I break out with them. I know this sounds crazy and my doctor even balked at this – but I have proven it over and over! I am a a dog lover – but whenever an adult dogs nose or “kisses” land anywhere around my chin or neck area I get one (or more) of these. I discovered this when I was 41 years old after years of wondering ‘WHY?! !’ It is 100% proven with me. I now keep my dogs away from that area and have no more problem. Just this weekend my grandkids dog ran up to me and nudged my chin with her nose – and the next day – this huge, sore, red, deep, blemish appears. Funny thing though – there’s a small percentage of dogs that don’t bother me. Like my Aussie doesn’t, but my Golden Retriever does. My beagl mix that I had for 12 years is how I discovered this. I had some friends watch her for a few of weeks during a particularly stressful season at work. My face cleared up. I got her back – more breakouts (staying broke out was my normal because she loved to nuzzle up under my chin). A light bulb went off, so I tested it again during vacation. After that, I kept her out from under my chin – and if there was accidental contact I immediately washed it off with soap and water. After 20+ years of adult “acne” I finally found the cause! And no – I did not just coincidentally “grow out of it” I’m now 50 – and like I said, if I come into contact with certain dogs (most) – I’m right back breaking out again. I’m not saying this is everyone’s reason – but at least explore the possibility of pet, fabric, and other allergens! Actually this is not crazy at all – I also noticed this from my dog if he ever planted a “kiss” on my face I would get a fairly deep pimple on that one spot! I may add this to an article about causes, before I thought I was the only one – but now you’ve mentioned it may be helpful to explore. Thank you for you sharing! Ive had this blind pimple on my nose. “THE NORTH STAR”For 2 weeks waiting for it to come to a head. It seems to look like its going to happen then goes back to a big red blob. Ive tried the Hot compress and apple cider vinegar and it just doesnt work……..
have you maybe tried buying a treatment cream. they can sometimes be expensive but can work to. i use clearasil. however, i will be honest, sometimes i get a breakout from it. i don’t know why though. You may be stripping away your skins natural barrier or you might even be allergic to it. Over washing over treating can be just as harmful as not washing your face. I was getting huge knots in my face when I younger, but it turned out I was just hives from an allergic reaction to benzoyl peroxide and stripping my skin. If i had only known that applying benzoyl peroxide on a blind pimple would make it worse, I would not have done it. For the first time I got a blind pimple. Today makes it a week since the pimple is on my cheek. It is the size of an iris in the eye. When i got the pimple i thought i would go away. Five days into the pimple it got red and swollen. So i went to the drug store and they told me to put benzoyl to dry it up. I have been putting benzoyl three days now. The healthy skin that was protecting my pimple dried up and flaked off. Today another layer of the skin came off. When this layer of skin came off the pimple began to bleed and now it looks worst. The pimple was bleeding so much that i had to put ice on it. I refuse to squeeze the pimple. But I paid alot of money for the benzoyl treatment and it made my pimple worst. I just put some ice on it to reduce the bleeding. It is my first pimple and By God’s Grace my last pimple. Can anyone please give me advice? I believe benzoyl peroxide *used* to only be used as a prescription from derms though now it’s open to the public. I would save that benzoyl for the next pimple (normal one, not one of these). I have the exact problem as you right now. Its so swollen that I can see it out of the corner of my eye. People will tell you to use apple cider vinegar…DONT. It made mine way worse. Then use hot compresses and ice daily….that’s the only way I’ve ever been able to get rid of them without scabbing my face up. Will any clay mask work for leaving overnight? I plan to purchase the clay mask on here, but right now I only have Freeman Purifying Avocado + Oatmeal Clay Mask. Mine is very deep with lots of inflammation, and it’s “juicing” quite a bit. It hurts really bad, and I’ve had it for a week. Yes most clay masks are helpful, as they help to dry out a pimple and reduce the inflammation. If you have this pimple right now it would be best to use the one you have as that is immediate. One week is quite a while for a pimple to still have inflammation, do try the ice approach to help with the pain and reduce it a bit. You can also try a small amount of rubbing alcohol dabbed on top to dry it out. Don’t try squeezing it, put your clay mask on overnight and any time you can, and ice on and off. Hope that helps! Blind pimples are just the worst, I am using the ice technique and hoping that it can help cure this pimple before next Thursday! I am also going to try the lemon juice and cotton ball.